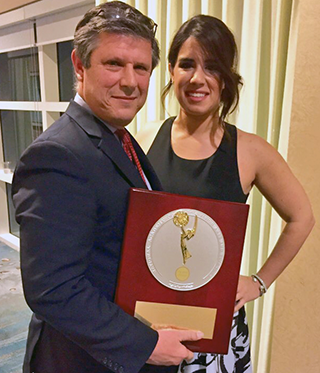 Jose Cancela, pictured below with his daughter, was presented with the 2015 Suncoast Regional Silver Circle Award at the 2015 Suncoast Emmy® Awards on December 5, 2015. Jose Cancela is President and General Manager of Telemundo Puerto Rico / WKAQ and NBC Puerto Rico. He is responsible for directly managing and executing the strategic planning, revenue generation, branding and corporate image for the Telemundo and NBC stations that serve viewers in Puerto Rico. Telemundo Puerto Rico is Puerto Rico’s first television station, launched more than 60 years ago in March of 1954. As the first local television station to launch on the island,Telemundo Puerto Rico has a rich heritage of producing and televising some of Puerto Rico’s most memorable shows and events. Launched in 2014, NBC Puerto Rico serves English-language viewers in the island, simulcasting programming from NBC 4 New York / WNBC. Viewers can watch NBC Puerto Rico over-the-air on channels 2.3 as well as on cable. In his current role, Cancela has overseen a significant expansion in the station’s local news operations, thanks to an investment made by NBCUniversal in its Telemundo stations to better serve Spanish-language communities, which includes hiring additional journalists and adding more local newscasts. The station produces about 40 hours of local news and entertainment programming each week, including live, local newscasts Monday through Sunday as well as the popular entertainment show, Raymond y sus amigos, among others. Other boosts in local news include the launch of a new consumer investigative unit, Telemundo Responde, charged with fighting for consumers that has already recovered over $1.4 million for consumers across eight markets, including Puerto Rico. Before moving to Puerto Rico, Cancela served as the President and General Manager of Telemundo 52 Los Angeles / KVEA, where he re-organized and aligned the station’s news and sales departments and elevated KVEA’s community presence. Earlier, Cancela served as President of Hispanic USA Inc., a Hispanic market firm based in Miami and as President of Radio Unica. From 1992 to 1998, he was the President and Chief Operating Officer for the Telemundo Station Group.